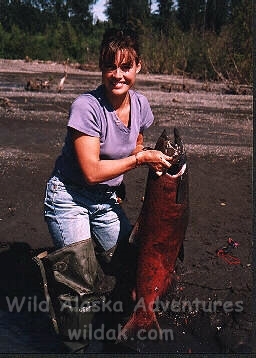 Heavy Salmon runs bring the bears to our doorstep providing an excellent opportunity for Bow hunters as well as rifle and Muzzle loaders. 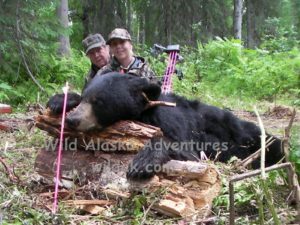 We offer fully Guided Black bear hunting in combination with the choice of Sport fishing before, during or after your successful hunt. This includes all food and lodging with home style meals, four wheelers, trail rides, and of course, all the Sport Fishing we can throw in. Hunting methods include tree stand bait set as well as hunting and stalking. However; it wouldn’t be surprising to open the cabin door and find your Bear at the steps! 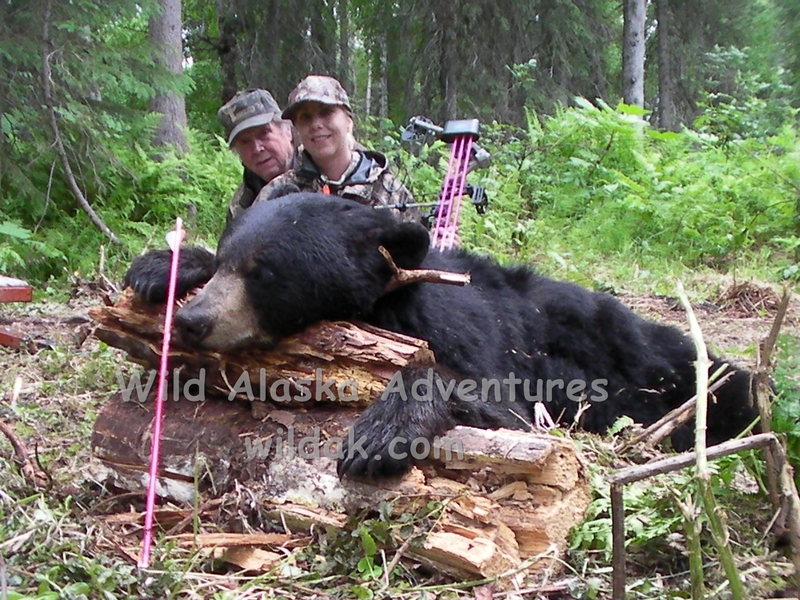 We start hunting in late May concluding black bear hunting in late June to early July.The quality of the bear hides are surprisingly good until late June. At this time the Black bears are moving out due to the high numbers of Brown bear moving in from the high country to feed on the recent arrival of King Salmon. This also presents a great opportunity for Brown bear viewing at the bait station. We have seen as many as six at one time making for some real excitement. Black bear are still around after this but keep a lower profile. While you are out hunting, the wife and ;or kids will be experiencing some of the best freshwater stream fishing in South Central Alaska; Unless they are the hunters in the family! 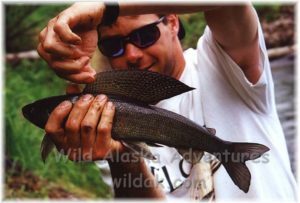 This adventure provides a unique Sport fishing opportunity for Rainbow trout, Arctic grayling, Dolly Varden, Northern Pike and more. King Salmon start coming up in mid June. 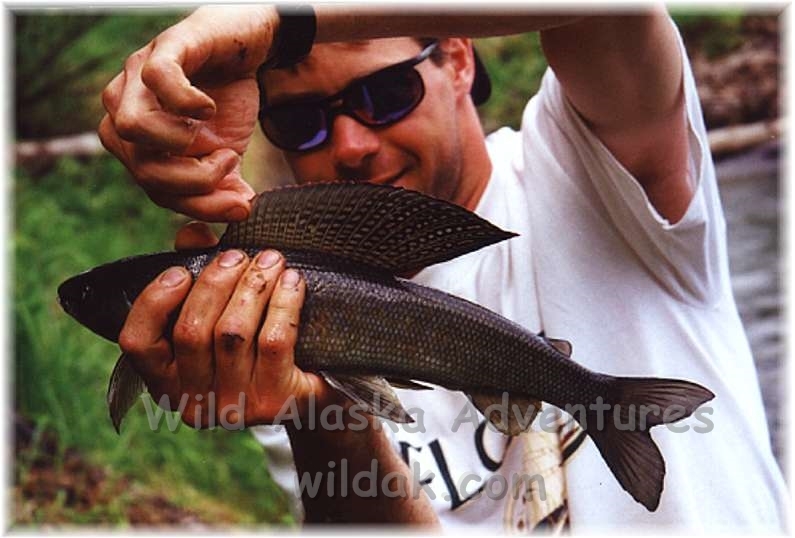 This is Freshwater fishing at its best combining a four wheeler trail ride through incredible primordial forests, heavy runs of Salmon, private airstrip and trail access, hand built cabins and more. Accommodations include cozy hand built Lodge and Cabins made with logs onsite. Wildlife including Grizzly bear and black bear are common and frequently seen offering Photo opportunities at every turn. For hunting, just bring your basic hunting gear including hunting license & tags, day pack, binoculars, sleeping bag and choice of weapon. Our package includes six days stay with five full days of hunting and fishing. 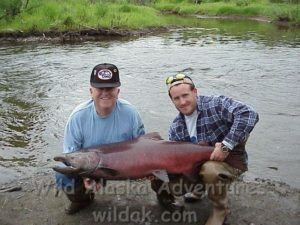 We arrange for your flight from Anchorage, Alaska directly to our Homestead Fish camp via Air Taxi. Upon arrival, we settle you into your cabin, familiarize you with our camp and local flora and fauna. After dinner, you can relax with an evening of quiet and awesome Alaska Range views.